Feline idiopathic cystitis (FIC) is the most common lower urinary tract disorder diagnosed in cats. Symptoms can include painful urination, urination outside the litter box and blood in the urine. Stress is a significant factor in the incidence of FIC. Veterinary researchers have determined that cats with highly sensitized nervous and endocrine systems are more prone to FIC. Research indicates that felines suffering from FIC may experience high levels of stress without exhibiting any noticeable symptoms. Fortunately, there are specific alterations to your home and changes you can make in your cat’s daily routine that can help to prevent mental and physical stress. The old adage that “good things come in small packages” couldn’t be truer with regards to the lively, lovable Dachshund, affectionately referred to collectively as “doxies”. Although it’s hard to imagine anyone abandoning one of these clever little canines, sadly it happens all too often. Fortunately, the Dachshund Rescue South Florida is committed to rescuing Dachshunds, giving them a chance to live better lives. That’s why we are so pleased to report that The Dr. Jane’s HealthyPetNet Foundation has granted a financial award to this worthy organization to help them cover the costs of much-needed veterinary services. 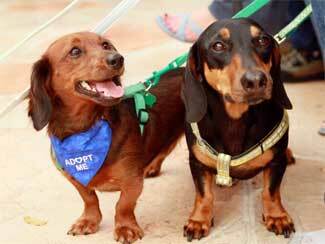 Dachshund Rescue views any successful animal rescue as one with the “patience and understanding” to oversee all of the steps of adoption, in order to give dogs a “second chance at a wonderful life”. And they have done more than just give Dachshunds a fighting chance; in fact, in their first two years of operation, they have saved the lives of over 200 doxies!